Today's post I'm wearing tropical print shorts and a casual button up. The floral shorts can be a real hit or miss they're a tailored fit meant to give a formal look but when I saw them I just thought they were pretty cool and thought I could probably pull them off. I knew if I wore these shorts the rest of my outfit had to be more subtle. I like to take risks with my fashion but not look crazy ha! The shorts are pretty.. short.. and the print? Most guys wouldn't dare wear these out in public but I enjoy being a bit of a trendsetter without going to over the top and making a fool out of myself. 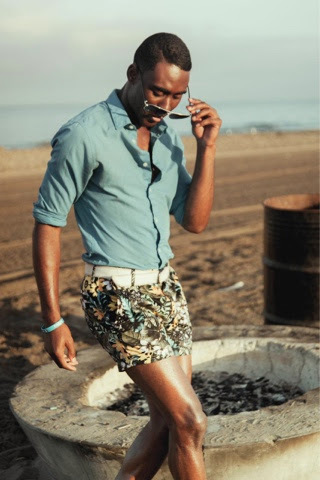 I think the button shirt not only compliments the shorts, the light blue offsetting the dark hues in the shorts nicely, but tones down the overall busy and eye catching qualities set by the shorts. As a whole, the look is attention grabbing without being too "loud". Its also a bit of a modern and reverse take on the Hawaiian shirt on cargo shorts that had the effect of making you look older. To accessorize I went for some aviator sunglasses that I really think help accent the feel and complete the look. I love these aviators! I have a thing for Big sunglasses. I call these my Paris Hilton's (remember when Paris use to wear really big sunglasses? No? Ha.